If you take a second to stop and look at it, you’ll see that the universe is a beautiful place, and on a dark night, you can see almost all of the stars in the night sky. 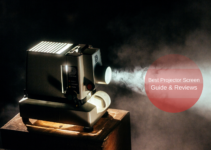 The problem is that you can’t sleep outside every night, and since you don’t have the ability to see through walls, you need to consider the next best thing, which is a star projector. With a projector, you can bring the untamed beauty of the night sky into your bedroom, and it’s a great product for the kids. Star projectors are great for kids because they create a relaxing environment, which makes it easier to fall asleep. Many of the latest star projectors produce realistic effects, and they’re great for people of all ages. Since they encourage relaxation, these products are particularly useful for babies, and they can make your child fall asleep faster. 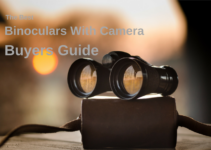 When shopping for a star projector, it’s important to consider the features, and some of the best products offer 360-degree rotation. 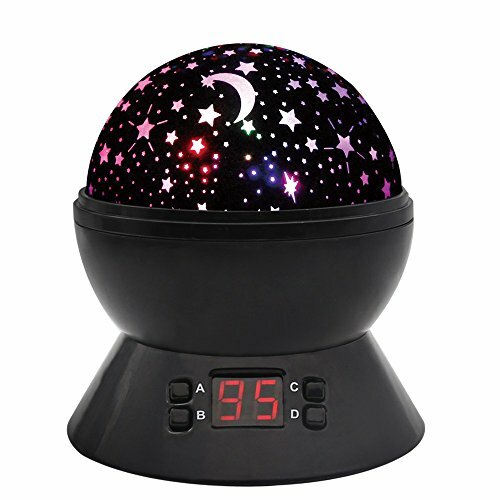 If the projected stars are constantly rotating, it creates a mesmerizing experience for your child and transforms the bedroom into a calming, soothing environment. You should also check the brightness and look for models that use LED bulbs. Below, you’ll find reviews for 10 of the best star projectors. 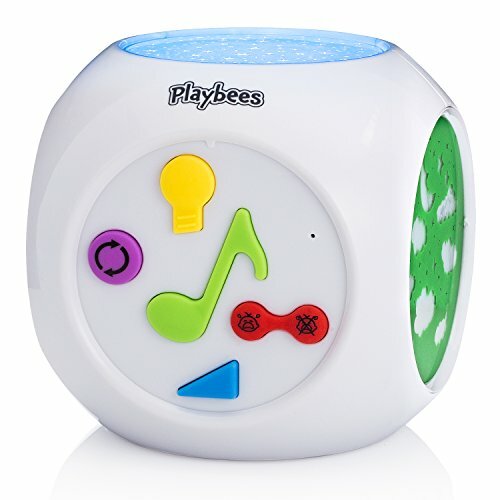 Here we have our editor’s pick, and it’s a top product from Playbees. This star projector is designed to help any child fall asleep faster, and you’ll enjoy it just as much as your child. 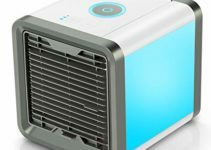 Although this product works well as a projector, it’s also a sound machine, and it can detect when your baby starts crying. Once it detects crying, it will activate and soothe your baby back to sleep. The relaxing star projector is great for children of all ages, and it’s designed to help babies fall asleep faster. The ceiling stars projected by the device can serve as replacements for a night light, and this device is perfect for children who’re afraid of the dark.This product comes with three different projections plates, which can be swapped out within seconds. It even comes with a sound machine and plays a variety of sounds. There is also a feature that mimics a heartbeat, which can make your child feel comfortable. The Playbees star projector can be turned on manually, or you can set it up to turn on when it detects crying from your child. Once it detects crying, it will activate and use its features to help your child fall asleep. 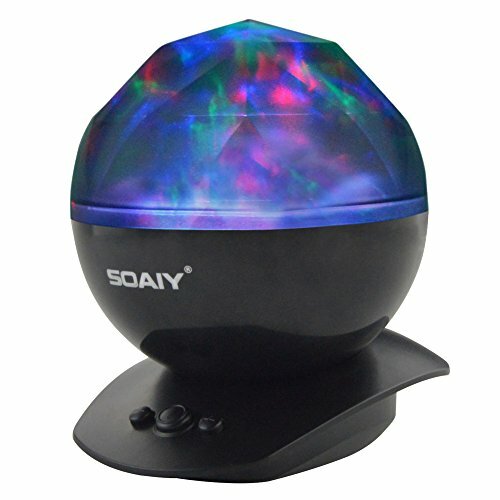 The SOAIY night light doesn’t project stars, but by displaying a dazzling light show onto your ceiling, it has the same effect on your child. This device projects a realistic show of the aurora borealis and creates a relaxing environment for children. If you’re looking for a way to comfort your children and soothe them to sleep, this product is worth considering. The SOAIY night light is ideal for children, but it can work just as well for adults.Since it has a certified CE wall plug, you don’t have to worry about the cord getting too hot. The USB cord that this product uses has a length of six feet, which is long enough for convenient placement. It offers eight different projection modes and uses several different light colors. It allows you to choose colors based on your mood, and with a built-in speaker, it can be plugged into an MP3 player, iPhone or iPod. With the ability to connect to external audio devices, it can play custom lullaby tracks and keep your children asleep. It can even shut off automatically after one hour. The Le Petit Prince projector is another popular product, and it has the power to transform bedrooms into stellar nurseries. The projected stars help to keep children relaxed and make it easier to fall asleep. This device uses multi-colored LEDs and projects beautiful stars onto walls and ceilings. It allows you to choose from four different LED settings, and it uses green, blue or orange colors. 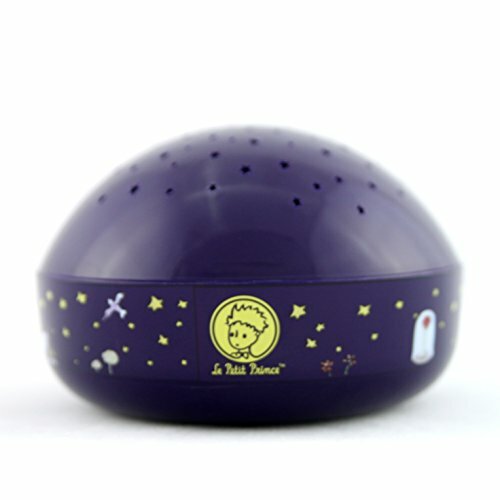 Since the device is touch sensitive, it’s easy to turn on, and it requires three AA batteries.Once the batteries are installed, the Le Petit Prince Touch Active star projector will run for 60 nights when used nightly. This product is easy to clean, and it’s designed with an emphasis on children. Since it’s ROHS compliant, it safe to use around children, and to prevent your child from accidently gaining access to the battery compartment, this projector is made with special screws. Although this product is designed to entertain young children, it can be just as useful for adults. The Airsspu Moon and Star projector offers three different model lights, and you can choose the best setting for your children. With the press of a button, you can switch the color to green, red or blue, and there are several different modes to choose from. This star projector rotates 360 degrees, and since it’s made with bright lights, the projected stars are brighter and vibrant. The Airsspu night light is very quiet and easy to use, and with a new engine, it produces almost no noise.The LED beads are bright enough to project a beautiful display onto a ceiling or wall, and with four AA batteries, this device can run for months. However, if it’s more convenient, you can run the device on electricity from an electrical outlet. Most children will love this device because it projects a mesmerizing galaxy onto the ceiling. The luminous LED lights provide calm ambiance and transform any room into a relaxing environment. The SlowTon Starry Night lamp is another top product, and with three changeable projection films, you’ll always have a new, exciting display for your child. The three different modes are happy birthday, ocean and stars moon, and this projector is ideal for any child’s bedroom. The SlowTon Starry Night Light offers six different light effects, and they consist of slow fade, combination, sequential, green, blue or white. With the A button, you can set your preferred color, and by pressing it several times, you can shift through the different light effects.A major advantage that this device has over similar products is a feature to adjust the brightness. Since there are three different levels of brightness, you can choose the ideal level for any situation. The B button allows you to change between five, 50 and 100 percent brightness, and the base rotates 360 degrees. 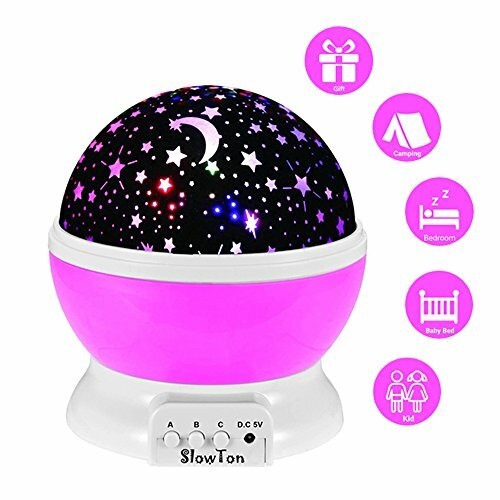 The SlowTon Starry Night Light is great for birthday parties or decorating, and it can be powered with a USB cable or batteries. If you have more money to spend, consider the Parrot Uncle projector. This device allows you to adjust the size of the projection surface, and it produces a crystal-clear display. There is no setup required, and for easy power management, it comes with an AC adapter. For enhanced safety, this device will automatically shut off after four hours, and a single button will turn it on or off.If you’re looking for a high-quality laser hologram projector, you find too many other products that can match the quality offered by the Parrot Uncle projector. Since it produces almost no noise, it’s good at keeping children relaxed, and it will help put them to sleep. With a quick adjustment of the settings, you can choose whether or not the stars move, and you can dim the blue nebula cloud. The Parrot Uncle projector is great for space geeks, and it’s also good at calming your children and helping them get to sleep. The Star Sky Night Lamp ANTEQI projector is another popular product, and with its built-in timing control, it can be timed for between five and 95 minutes, which is useful for children who take longer to fall asleep. Once the timer has been set, the device will turn off when the designated time is reached. The inside of device is loaded with four bright LED beads, and the LEDs produce red, green or blue light. 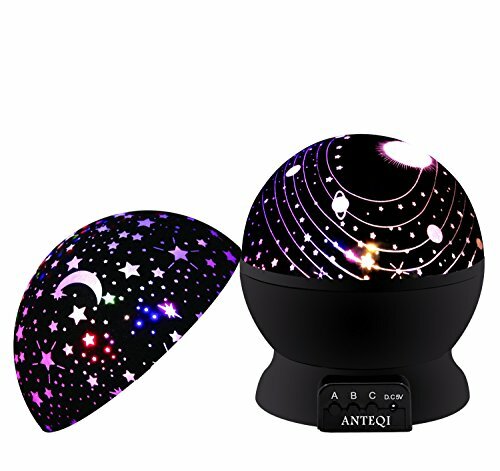 There is also an option for a multi-colored display, and the ANTEQI Star Sky Night Lamp is great for parties, birthdays and weddings.If you’re looking for a way to bring the beauty of the cosmos into your bedroom, then this star projector is worth considering. It works well as a romantic night light, and to keep the display interesting, the base rotates continuously. Since it can be powered several different ways, you can choose the option that is most convenient for your needs. This device features a new engine and produces no more than 30dB of noise. There aren’t many products that can make you feel like you’re sitting under a real galaxy, and the In My Room Star Theater is one of the only products that can do it. This product is an optical star projection system, and it’s made with a high-quality lens. With an adjustable focus, you have complete control over the display, and the ultra-bright LED light source brings the display to life. 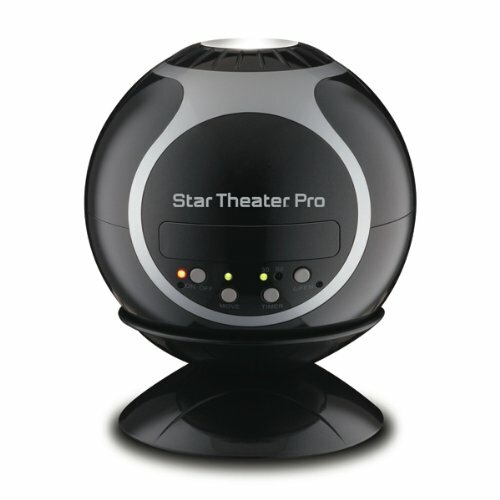 The In My Room Star Theater PRO keeps things interesting with motorized image rotation, and it can be used almost anywhere.This device comes with two different discs, and it allows you to explore distant galaxies without ever leaving the comfort of your bed. This projector can turn your home into a planetarium, and it even comes with a planetarium soundtrack. Here we have another top star projector, and it’s made by ANTEQI. This product works great for kids, but it’s also a great choice for space geeks. Since this is the newest version, it features four LED light beads, and it comes with a long USB cord. For maximum entertainment, it comes with two different star covers, and there are three different modes to choose from.You should find this product useful for baby’s room and wedding decorations, and with a rotating base, it has no trouble keeping things interesting for whoever is looking. The ANTEQI Night Light Kids Lamp is even brighter than previous models and offers an unforgettable experience. The Lightahead star projector offers mystical light effects, and it can turn your bedroom into a calming, relaxing environment. This projector can be adjusted for different lighting patterns, and the LED light source alternates between red, green and blue colors. 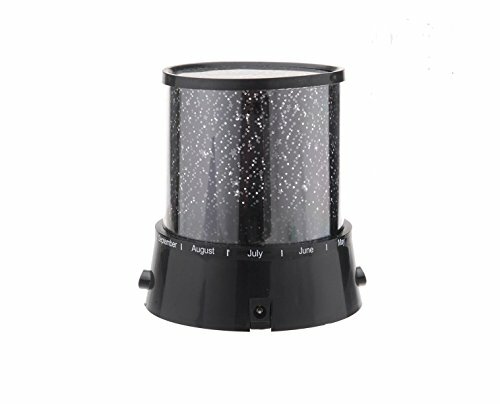 Since it comes with a power adapter, you don’t have to deal with batteries, and you can use this star projector for family gatherings or place it in your child’s room. The high-quality LED light source is bright enough to create a dazzling display, but it won’t keep you awake. 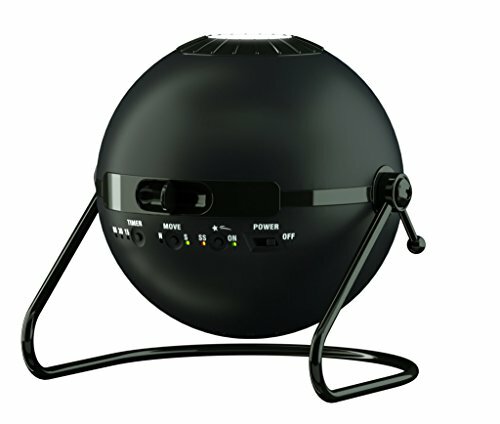 The Sega Homestar home planetarium is from Sega Toys, and it’s one of the best star projectors that money can buy. With advanced lens technology, it produces a staggering 60,000 stars, and it even has the ability to mimic the effects of shooting stars. For a bright, beautiful display, it uses a three-watt LED bulb, and it allows you to adjust the focus, angle and timing. The Sega Homestar comes with two realistic discs, and if you need more variety, you can choose from four optional discs.